Sure, when you buy a new car you can typically expect to travel several-thousand miles before regular maintenances/problems pop-up. On average, cars start to have minor problems after about 40,000 miles—especially with (sadly) American-based vehicles. After 100,000 miles, the intervals between performing regular maintenance and fixing vehicle problems start to become much more frequent. Nonetheless, this article aims to enlighten you on the basic things you should routinely check for on your car. Leaking Fluids under the vehicle are one of the most tell-tale signs of a problem with your engine. Many times if the liquid appears clear, like water, it's something minor. More often, though, you could be facing a much bigger problem. · If you see any leaks comes from your engine, check to make sure your oil is full, that it's more amber or yellowish than black, and check to ascertain whether your fluids (radiator, braking, steering, transmission, etc.) have good levels. · Side note: Healthy oil should have the color and texture of, say, dark honey. 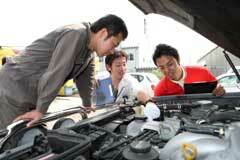 · Does your engine have oil or remnants of oils on it that wasn't there before? Check your spark-plugs wells for the presence of oil, as well. · Is your transmission shifting smoothly and accurately? · Are they are any weird noises coming from the engine bay or undercarriage? · On the exterior of the car near the bottom, can you smell something that seems like its burnt or otherwise foul? Most of those items can be examined by anyone who has even only changed spark plugs, or the novice mechanic. 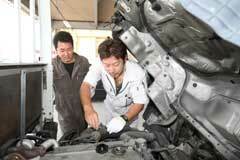 However, you should have a good deal of experience working with engines if you try to repair the problem yourself. Moreover, it's usually wise to seek a professional mechanic's expertise—depending on the severity of the problem and difficulty of fixing it. Most of those are pretty good indicators that you have either a) an engine that is burning oil via the combustion chamber b) a head gasket which has been cracked or c) a much more serious situation that involves a faulty fuel delivery process. If it is white smoke, then your problem is more-than-likely B or C. If you observe blue smoke coming out of the tailpipe, then the culprit is probably A. · The engine stalls, or has to turn over several times to crank. · You have to frequently jump-off your battery for no apparent reason. · You have particular warning lights in the gauge cluster that remain on even when the others have disappeared—e.g. "Check Engine" "Low Coolant" etc. · If more than one electrical device (such as the interior lights and gauges) stops working or works intermittently. · If you notice white or off-white flakes on the battery, especially near the + and – leads. · If, upon inspection of the fuse-box, you notice missing fuses—or if replacement fuses keep-on failing. · Can you hear a rattling noise coming from the engine, almost as if the spinning components had a thin wire flicking or entangled in one them? Many of those items are usually indicative of either an alternator that is on its last leg, or dead-altogether (especially if you cannot crank the engine, or if the engine will not stayed cranked when idling). The alternator should be replaced by a certified professional, or an experienced lay-person. Additionally, the "check engine" light can be indicative of many more things than just electrical problems. Many times, it will indicate that engine performance is suffering due to bad/low oil reserves—regardless of whether the "low oil" light is on. Furthermore, there are literally dozens of other problems that this light could represent. In all cases, it is very wise to have it checked out by an auto mechanic.